Our new commissioning map plots the boundaries of all 195 Clinical Commissioning Groups (CCGs), by region. Each region has then been colour-coded for easy reference with those CCGs working together depicted on the map with matching colour and shading. 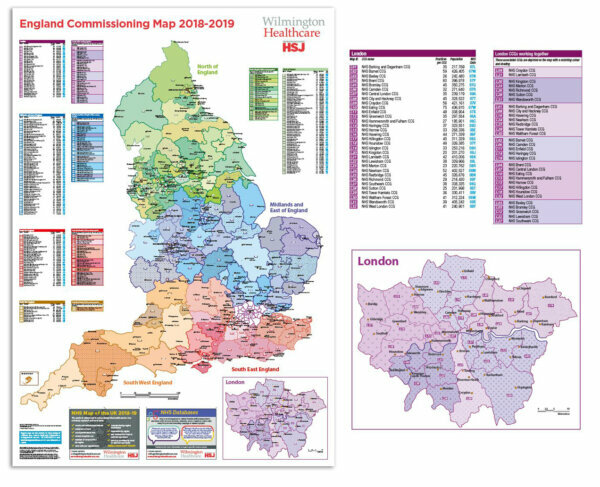 So, whether you need to map your sales territories or to visualise the ever-changing boundaries of the commissioning landscape our England Commissioning Map provides the solution. The map is B1 size for maximum visual effect, and gloss-coated for write-on/wipe-off purposes, making it the ideal tool for reference, plotting and planning.